“What do you want to be when you grow up?” Ahhh…the age-old question that adults have been asking kids for generations. For some, it elicits thoughts of possibility and future dreams. For most, the response is anxiety, fear and dread…sweaty palms and heart palpitations optional. 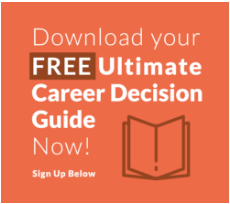 Picking the right major and career path can be overwhelming and intimidating…and that’s totally normal. To get the other 2 videos in the series, sign up here to have them sent directly into your email inbox.